Aston Villa held off a spirited Swindon Town fightback to progress to the Capital One Cup quarter-finals. 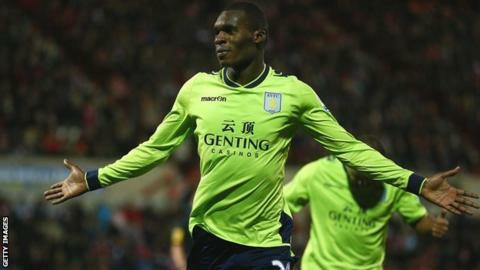 Villa held a 2-0 lead at half-time after Christian Benteke dived between two Town defenders to head in and Gabriel Agbonlahor fired in a low shot. Swindon hit back through 18-year-old substitute Miles Storey, who netted two quick goals from inside the area to give Town hope. But their efforts proved to be in vain as Benteke lashed home a late shot. Paolo Di Canio's Swindon were looking to continue their destructive form against higher opposition, which has seen them win eight of their last 11 meetings against teams sitting above them in the Football League. And they almost caused another upset against Paul Lambert's Villa side, who have won just one Premier League game this term. It was Swindon who looked the most lively early on but they lacked the cutting edge up front, with former Villa youngster James Collins scuffing wide from Matt Ritchie's cross. Villa survived a scare at the back as Paul Benson's shot on the turn was forced off the line by Matthew Lowton, and the visitors immediately hit back on the break. Stephen Ireland provided a cross for Benteke to nod past Swindon keeper Wes Foderingham. Villa found themselves further ahead thanks to Agbonlahor's superb solo effort, which saw him cut inside from the left flank and power home from the edge of the area. Swindon had a number of chances after the restart - Gary Roberts poked wide from two yards out and Benson could not latch on to Ritchie's inswinging cross while Foderingham did well to stop Benteke's effort with his feet at the other end. Di Canio introduced Andy Williams and Storey to the game and the substitutes invigorated his side. Storey, a product of Swindon's academy, bundled home Raffaele De Vita's cross and flicked in a second three minutes later from Williams's volley to send the home crowd wild. Both sides pushed to find the all-important third and it was Villa who kept their nerve to make the breakthrough as Benteke found himself unmarked in the area and slotted home with ease.